Rei Rea knows well how to create disturbing and intense sonic situations. Like other albums I have heard from Christian Dubé, “Mallow dents”, another fine DIY release from Crater Records, is a nicely packaged doom bringer. Once again, Rei Rea proves to be disturbing, unsettling and almost too dense to handle. These six tracks, from ‘Hume soup’ to ‘Droi Mess’, create a gargantuan, droning beast. More precisely, this beast is slowly dying, releasing one long and slow cry of agony. It begins with heavy, wet and cavernous breathing on ‘Hume soup’. Echoing wailings of despair are giving way to more focused shrieks on ‘Deader’, where Rei Rea is turning into more horrific scenery, employing haunting drones and maniacal, if distant, screams. Mallow Dents witness this imaginary beast and its last battle with its impending death, and ‘Deader’, lasting over eleven tormented minutes, is perhaps it’s most hostile and painful moment. ‘Blaz’ introduces sharper drones that grow closer and closer to the skin, producing barely audible, desperate weeping. Air is running out as the sounds grow denser and denser. Further into the album, ‘Mallow Dents’ loses the heavy emotional burden and continues as a distorted death ambient piece, like on the track ‘Impale’. Eyes are heavy, heart is heavy and lungs are gone, the beast that Rei Rea had erected, only to see its demise, is giving in. The next two tracks, the heavily distorted ‘Final’ and the beautiful and almost gentle ‘Droi Mess’, are serving as a form of eulogy and an epilogue to the entire album. The last beatings of the last track only remind me how powerful the entire album was. 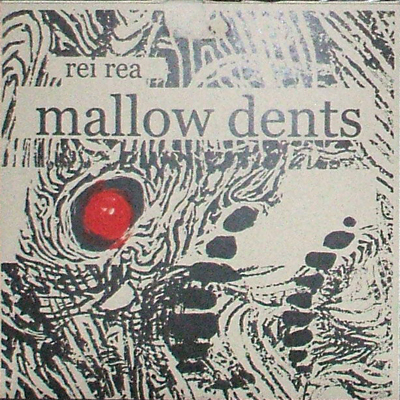 ‘Mallow Dents’ ends as a powerful, heavy and restless album in which Rei Rea brings harsh drones in the finest of ways. Excellent and recommended!